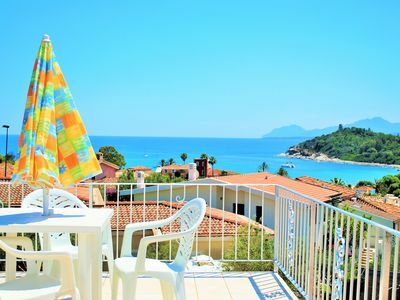 Villathis property is a graceful studio apartment surrounded by the greenery. It sleeps two people. 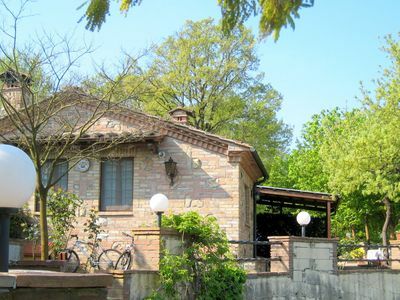 From Villathis property you will enjoy a characteristic view of the Umbrian hills and of the surrounding countryside. 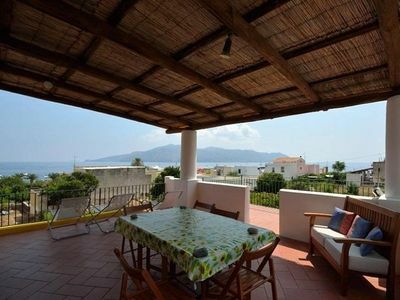 Villathis property is 30 square meters (320 square feet). It features a shared swimming pool, a shared patio, winter heating and WI-FI Internet access. 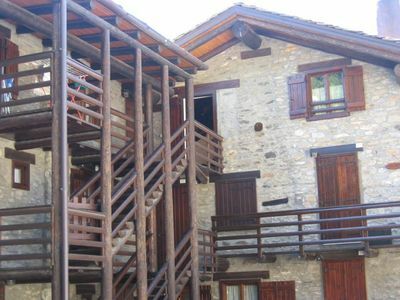 You will be roughly 5 km (3.1 miles) from the medieval hamlet of Montone, where you will find restaurants and shops. You will reach Villathis property from the main entrance of the building along an external stairway which consists of approximately 20 steps. To stay at Villathis property you will need a car. You will be able to park it free of charge on the premises. 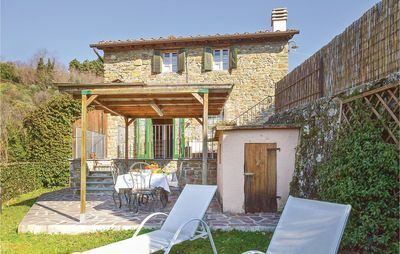 Villa Pavone is in the middle of a 120-hectare agricultural farm which stretches over a verdant valley at the same height of the secure medieval hamlet of Montone, a small village which is listed as one of the most beautiful hamlets in the world. 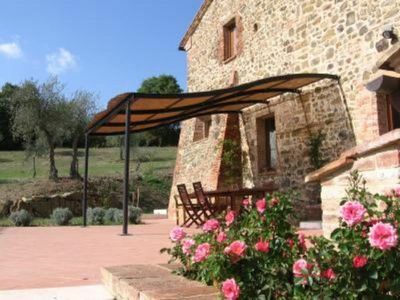 Almost the whole land of the farm is actually pasture or range, being used to breed cattle of the famous Chianina breed. Cultivations and breeding of animals are developed with organic methods. 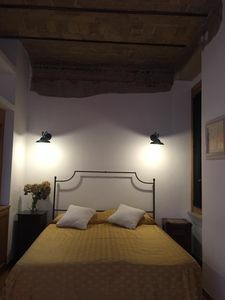 The old countryside houses have been restored to host guests in small apartments which still keep the simple warm and cozy furnishing style of country homes. At your arrival at the villa, you will notice a group of age-old buildings in grey stones surrounded by the verdant countryside scenery. Porticos and outdoor staircases render the façades picturesque. In front of the villa, there is a large courtyard around which the outdoor spaces available to all guests are distributed: the swimming-pool, the sun-drenched area, the gazebo, the barbecue, and the playground for kids. 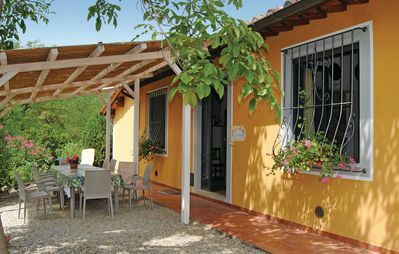 You will be greeted by the kind and friendly proprietors: they will soon make you plunge into the relaxing atmosphere of a simple and tranquil vacation where you will be in contact with nature and all the activities developed in the countryside. An extraordinary resource of the farm is the spring of mineral water which flows not far from the house: its temperature is the same all year round, which means it comes from deep underground. During summer you will find it delightful and unique to get fresh water straight from its source! Also in the place, it is possible to purchase products from the farm, vegetables, salamis, and homemade sweets, not mentioning the opportunity to taste super-size grilled steaks taken from the Chianina breed. Breakfast and dinner is available upon booking. The farm is located within a natural reserve area where hunting is forbidden. Mountains bikes are available for you to visit the place and surroundings. In the farm, you will also find a lake where you can go fishing and a bocce field. You may also see all the activities which are run inside the farm, especially apiculture. 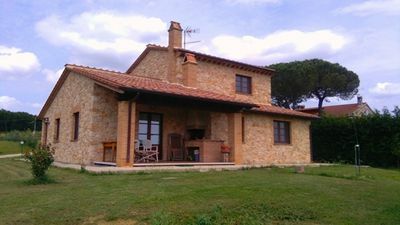 As guests of the farm, you will be able to attend and have a discount on a thermal bath establishment in Umbertide, only 5 km (about 3 miles) away. 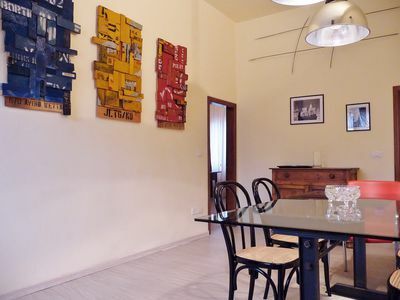 In the small reception hall of the farm, you will find all the information regarding tourist activities of the region and a socket suitable for laptops and internet connections. The swimming pool is 8 meters (26 feet) large by 16 meters (52 feet) long. 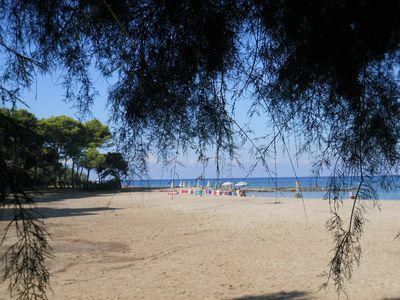 The area is equipped with tables, chairs, sun umbrellas, sun loungers and a gazebo. 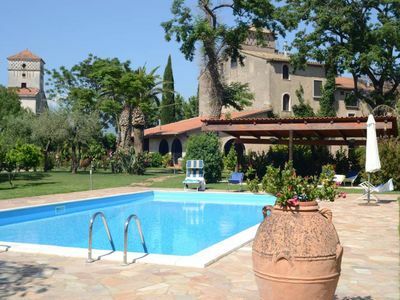 From the swimming pool you will enjoy a nice view of the greenery and of the surrounding countryside. 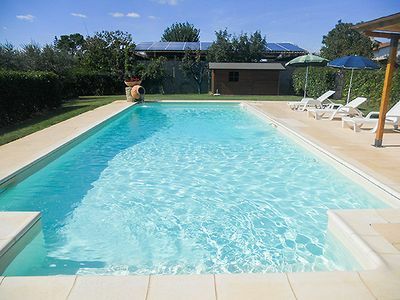 You will share the pool with guests staying at another nearby villa. The patio is shaded by a large porch. It is equipped with tables and chairs. Here you will also find a barbecue and a wood-fired pizza oven. The patio is shared with guests staying at another nearby villa. In the garden you will find a fenced children's playground. 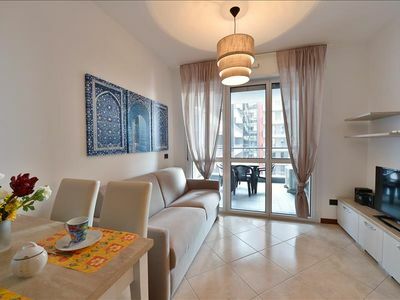 From the garden you will enjoy a broad view of the swimming pool and of the greenery. 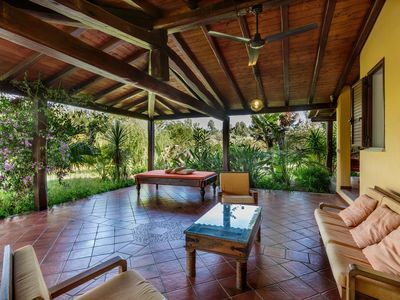 You will share the garden with guests staying at another nearby villa. The living room is paved with terracotta tiles. The furnishings are simple. 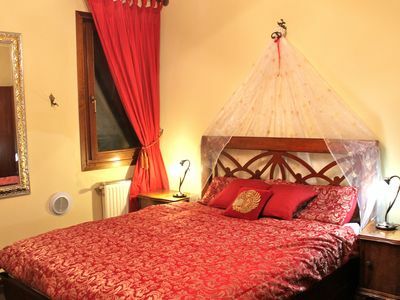 Here you will find a matrimonial bed (160 cm/62 inches, wider than a queen-size bed). In the living room you will also find a cooking area. 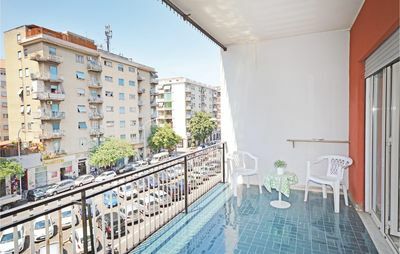 The kitchenette can be closed in a cupboard and is equipped with a four-burner gas cooker, a small refrigerator without freezer and an Italian-style coffee-maker. The dining table can accommodate two guests. In this room you will find a television (local channels). The room has three windows. 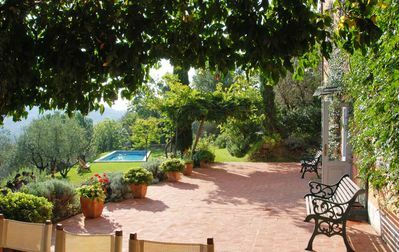 This villa, in Coldipozzo, boasts a gorgeous valley view sleeping 2 people. 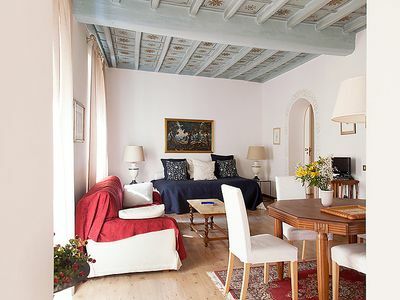 Casa Sonetto A: A welcoming apartment built on a hillside, surrounded by meadows and woods, with Free WI-FI.